In the tutorial, technique: choosing a substitute yarn, I walked you through the steps I recommend for identifying a substitute yarn that will behave the most like the yarn used in the original pattern. Now we’re going to apply those steps to the task of finding good substitutes for the yarn used in the pattern Shades of Grey—Cascade “Rustic”, a blend 79% wool and 21% linen that is no longer produced. Step 1: Determine the weight of the original yarn. Cascade “Rustic” was 196 yds per 100g skein, so our yards-per-gram figure is 1.96 (196 divided by 100). Step 2: Consider the resilience of the original yarn. We know that 79% of our blend is wool; that’s a high percentage of highly resilient fiber. The linen that makes up the remaining 21%, is a cellulose fiber that lacks elasticity, but offers drape and durability. The inelastic linen component of this yarn will subdue the highly elastic wool component and give us a yarn of moderate resilience. Step 3: Review the construction of the original yarn. The Materials listing for this pattern tells you this is a single ply yarn. Single ply yarns, especially those made with high wool content, are generally loosely spun yarns with little twist. This yarn fits that description and so its construction suggests a further taming of the resilience contributed by the high wool content of the yarn. The stitches in a fabric knit of this yarn will be simple, clear and rather two dimensional; the linen streaks will create a heathery, almost tweedy look. Swatches A-C were all substantially wider and taller than the original, suggesting the yarns may be too heavy to make good substitutes. Swatches D-I are all very similar in width and height and look like very good candidates. Swatch J knit up bigger than I expected despite being within .01 yards-per-gram of the original yarn; its Tencel component may account for this. Swatch K appears to be another good candidate. Swatch L is a bit big but a very appealing match in terms of color and texture. Swatch M is another that is surprisingly large, one of the largest though its yard-per-gram suggested it would be one of the smaller swatches (yarn construction being a factor here). Swatch N would appear to be a bit small. Let’s see what changes when we wash the swatches. Swatches after washing: Swatches were soaked in lukewarm water and gentle soap for 15 minutes, then rolled in towels to remove extra water and blocked only to the extent that swatches were rectangular and welts were straight. They were allowed to dry completely. All the swatches relaxed somewhat, their welts opening and separating to different degrees. The original yarn did not change much as a result of the washing nor did Swatches E or K. Swatches B - D and F - G grew wider and taller. Swatch I expanded more than I expected whereas Swatch J seems to have tightened up (Tencel tends to shrink a bit when washed.) N has gone from too small to matching the original yarn swatch in size. Next let’s examine the swatches in terms of gauge. Swatches A-D achieved gauge easily; that combined with the fact that they have been larger than the swatch of the original yarn at every stage leads me to predict that while each would make a very nice Swirl, the result would be larger than expected. Of the four, I found Swatch C, Rowan “Felted Tweed Aran” to be the best substitute. The swatch of the original yarn required a hard pull to achieve 4” length; this is appropriate given the high non-resilient linen content (that will stretch when worn) and the low twist of its construction. 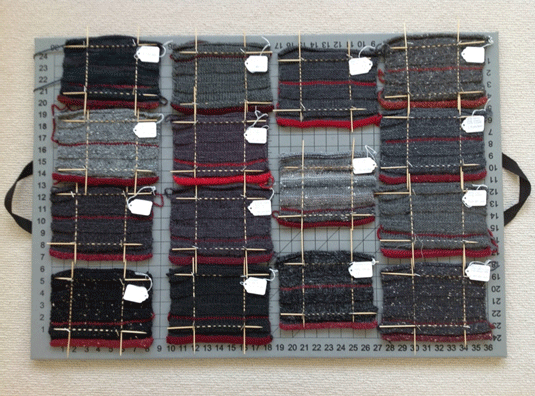 Swatches E-I achieved gauge with moderate adjustment in length appropriate to their fiber contents. The close match of yards-per-gram with the original and the results at all stages suggest any of these yarns will produce very nice Swirls true to size. Of the group I thought Swatch E, Plymouth “Mushishi” produced the best rustic fabric and G, Karabella “Aurora 8”, the best refined fabric. Swatch J performed in a manner that suggests it would work well as a substitute for Shades of Grey, but being unfamiliar with how Tencel performs in a Swirl, I’m hesitant to say more than that. Swatch K achieved gauge easily, and accepted blocking better than I’d expected given its high acrylic content. Swatch L achieved gauge easily, perhaps too easily given its silk content and fact that it relaxed to wider than the original yarn swatch. I would go down a needle size on this yarn. Swatch M achieved gauge much too easily and has been bigger than expected at all stages. Go down a needle size on this one, but even then you may get a bigger than expected result. Last but not least, Swatch N, achieved gauge comfortably and produced a very nice fabric. Despite being on the outer edge of our weight range, it appears to be an excellent substitute. I suspect it will knit up a bit smaller than expected, ideal for those who want to size down just a bit. Yarn N, Mountain Colors “River Twist” in Rock Creek and Copper Creek colorways, is actually a blend of many different colors for those of you who like the mottled look of Shades of Grey but want to get more color into your Swirl. 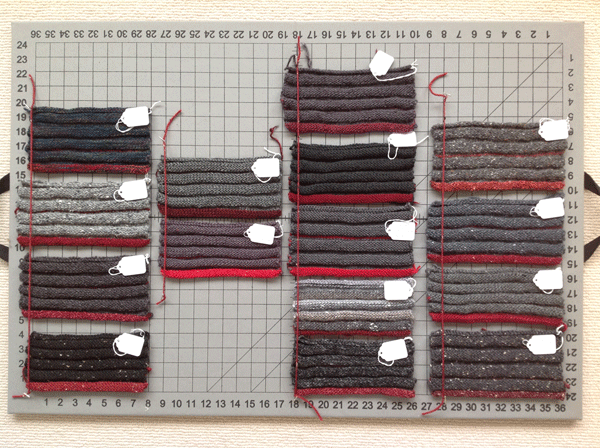 Last, I leave you with a photo of the swatches resting unpinned after spending 36 hours pinned to gauge.